L.A. Fashion District: The Most Recent Target of the U.S. Government's Crackdown On Money Laundering And The BMPE | TaxConnections is a where to find leading tax experts and tax resources worldwide. The Los Angeles Fashion District spans 100 blocks, with over 2,000 businesses selling fashions and accessories at 30% to 70% off retail prices. Saturdays are the busiest Los Angeles Fashion District shopping days, when wholesale-only shops open to the general public. The Sunday shopping epicenter is Santee Alley, between Olympic and Pico Boulevards, where you’ll find low prices, lots of knock-offs and fakes. Thanks to a recent raid of dozens of businesses in the Fashion District, rock bottom prices and a wide-selection of clothing isn’t all that the Fashion District is now known for. Law enforcement operations have revealed that money laundering activities and Bank Secrecy Act (BSA) violations are as pervasive throughout the Los Angeles Fashion District as brothels are in Amsterdam’s Red-light District. Much of the money laundering is conducted through the infamous Black Market Peso Exchange, in which drug money in the United States is converted into goods that are then shipped to countries such as Mexico. There, the goods are sold and the proceeds – now in the form of pesos, Mexico’s local currency – make their way back to drug lords and drug trafficking organizations. Nearly 1,000 federal and local law-enforcement agents stormed the city’s Fashion District on September 10, 2014 as part of a long-running investigation into alleged money laundering for Mexican drug cartels. During the raid, Special Agents seized more than $90 million in currency. The cash was found at various residences and businesses stored in file boxes, duffel bags, backpacks and even in the trunk of a Bentley. According to court documents, garment businesses allegedly aided the cartels in getting proceeds from drug sales in the U.S. back into Mexico. Specifically, L.A. garment businesses allegedly accepted bulk U.S. cash from drug cartels and repaid the cartels in Mexican pesos, through brokers, after selling the garment businesses’ clothing in Mexico. 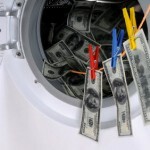 It was at this stage of the cycle that the “dirty money” was cleaned in order to give those who were viewing the transaction from the outside (i.e., law enforcement) the false impression that it was derived from a legitimate source. Banks in the U.S. likely had ties to the firms involved in the alleged scheme, said Daniel Wager, head of anti-money laundering for HSBC Holdings. Mr. Wager said anti-money laundering professionals should be looking for the “single biggest characteristic” of trade-based money laundering, goods shipped to different places than the money paying for them comes from. “It’s the asymmetry of goods to payments. It’s payments from the U.S. for goods in China being delivered to another country, namely a high-risk narcotics jurisdiction,” said Mr. Wager, speaking at last week’s Association of Certified Anti-Money Laundering Specialists Conference. “When you want to send money to a family member or buy a gift for somebody, you might on occasion buy something and have it delivered somewhere else,” he continued. “Do you really often see a business in Mexico that imports large amounts of electronics but their [bills are] paid by an unrelated third-party in New York? That is a pretty big red flag” and banks need to figure out how to spot that, he said. As challenging as this type of money laundering was to investigate, Mr. Wager said that it was still easier to spot than money laundering that’s done by mispricing goods. Stricter anti-money laundering measures are set to go into effect for the district on October 9, 2013. More than 2,000 businesses in the Los Angeles Fashion District will be subject to stricter cash-transaction reporting requirements mandated by the Treasury Department’s Financial Crimes Enforcement Network. (10) Stores bearing “import” or “export” in their name. Thus, GTO impacts most businesses in the L.A. Fashion District. Information gathered pursuant to that GTO provides U.S. law enforcement with an unprecedented ability to identify precisely who is moving money into and out of the United States using armored cars and other common carriers of currency.